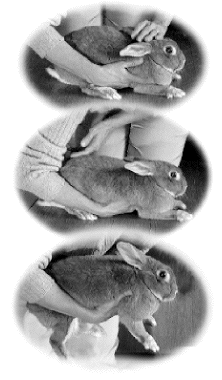 Rabbits can resist being lifted and carried in a number of ways. Reacting instinctively to a predator-like grasp, they may run away, hide, struggle. When lifted, they may kick, or launch into space. A normally affectionate rabbit may express indignation by wriggling, stamping, or nipping you. All are attempts by the rabbit to retain solid ground and control of his own fate. Knowing your rabbit does not necessarily want to be picked up, it is up to you to lift the rabbit properly and help him feel safe. It is important. Here are the basics of lifting your rabbit. Use the environment to your advantage. The easiest starting place is a small area accessible from the top, such as a top-opening carrier or cage, pen, or small room with no hiding places. More difficult is a cage or carrier with a small side-opening door, or a small shelter cage door. Rabbits are good at bracing themselves, and some will lunge, and box if cornered. Please do not just grab the rabbit or pick up by the scruff of the neck and drag him out of the cage. Serious and fatal back injuries may occur. Do not throw a towel at the rabbit and then further traumatize him by bundling him up and treating the rabbit roughly. This is terrifying for the rabbit and may cause aggressive or defensive behavior and may cause injury or death. Open the cage and lift bunny out preferably using the pick up under the body supporting the front. 1. In a kneeling position, pet with one hand, while sliding the other hand down bunny's side. 2. With your arm at bunny's side, slide it under his torso, while your (petting) hand moves toward his rump. 3. Support bunny's chest with your hand and his torso with your arm. Lift, while the other (unseen) hand supports the rump. your right hand under his chest. If he accepts this, take your left hand from his head and use it to support his groin. Otherwise, lift using your hand to support the chest, and your arm to support the side and hindquarters. Scoop him to you and hold him firmly there. The key to this method is to position the rabbit within a few inches of you. That way you will shorten the suspended-in-air stage. 4. Once bunny is lifted, hug him securely against you with one arm, supporting his body and the other arm supporting his hindquarters. Tail First: If you do not have a top-opening carrier and you must pull bunny out of a carrier or cage, try the backwards method. Pet bunny and reassure him. Turn him around so his bottom is facing the door you must get him through. Take his chest in one hand to prevent forward movement, and with the other hand, maneuver his hind end towards you. Once you have his hind feet out, the hard part is over. The Beginner Lift: Now that bunny is out of the carrier, it's time to lift him. The following are directions (for right- handed people) if you are uncertain, or having trouble lifting your medium-to-large-sized rabbit. Start with the rabbit on the floor. Approach him slowly and pet him, leaving your hand on his head to assure him. Rabbits feel uneasy, and may struggle when they are lifted off the ground. So be prepared before you lift to have a good hold and to provide stability so the rabbit feels safe. 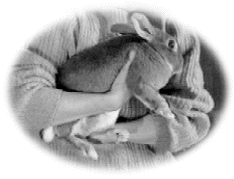 Visualize how you want to hold the rabbit once you have lifted him. For example: the rabbit right side up, nose pointed to the left, left side along your midriff, supported by your right arm. Next, slide the rabbit around while he is still on the ground, until he matches this position, i.e. sideways and pointed left. Is he thinking of leaving? Keep your hand on his head, or gently grasp his shoulders. Do not lift by the scruff. If he runs, don't grab him. Follow him, using baby talk to lighten the moment. Wait until he stops, and start again. The scruff pick up with support of the hind end is used only for emergencies. (Includes the dog on the loose visit, the rabbit that is in panic or the rabbit who has gotten into a fight with another rabbit. In dangerous situations bring the rabbit to safety. Don't assume a rabbit in your arms is thinking of his own safety. If he is uncomfortable or impatient or if he feels off balance he will want to jump down. The trouble is, rabbits are fragile. Their skeletons are light compared to their bodies, and susceptible to trauma from falling, twisting, and kicking. If a rabbit you are lifting or carrying begins to struggle, you must overrule your impulse to let go, and hug the rabbit to you. Use your body as a support. This will protect the rabbit and keep him from hurting himself. It will also teach him his "drop me" strategy will not succeed and that he is safe when he is lifted. When you are ready to return your rabbit to his area, he may want to hurry up the process and nosedive towards the ground or back of the cage. Try to avoid this method of putting the rabbit back on the ground. Prevent injury by carefully turning him around, and setting him down back legs first, while he is facing you. The principles of lifting and handling your rabbit safely allow for several methods. The method you use will depend on the size and temperament of the rabbit you are lifting. Rabbits are context smart. If bunny is lifted from cage to exercise area, lifting becomes a positive means to an end. On the other hand, if the only time bunny is lifted is when play time is over or he has to go to the vet, bunny may learn to flee. One solution is to reward him for traveling on his own feet. An open door, a nice stack of hay and some fresh veggies in the cage, versus a human determined to track him down and pick him up, is an easy choice for most rabbits. Rabbits can even learn to climb ramps to return to home base. In a similar way, some rabbits prefer to hop in a carrier rather than be handled. For these independent individuals, lifting drills followed by treats, are the best insurance against the day grooming, travel, vet care, adoption appointments or medicating is needed. Pay careful attention to the rabbit when picking up.